Click here to take a Look Inside The Madness of Mercury. San Francisco astrologer Julia Bonatti's life is turned upside down when she becomes the target of the city's newest cult leader, Reverend Roy of the Prophet's Tabernacle. Driven out of her apartment in the midst of a disastrous Mercury retrograde period, she takes shelter with a client who's caring for two elderly aunts. One aunt appears stricken with dementia and the other has fallen under the spell of the Reverend Roy. To add to the confusion, a young man claiming to be a long lost nephew arrives. The longer he stays, the more dangerous things become. Is the young man truly a member of the family? Can astrology confirm that? 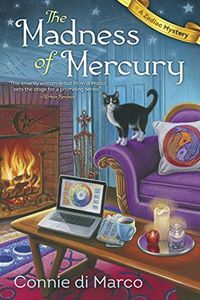 Julia's not sure, but one thing she does know is that Mercury wasn't merely the messenger of the gods — he was a trickster and a liar as well. To see more new paperback titles scheduled to be published this month, visit The Mystery Bookshelf for June 2016. For new hardcover titles, visit New Mysteries where for a list of June 2016 mysteries, novels of suspense, and thrillers is provided.